I first heard about Edgar Hilsenrath after reading his obituary in the paper, so I guess you could say I was late to the party. Still, his work sounded interesting and I thought I’d check it out. Unfortunately, the only book of his available from the Ottawa library was a French translation of Nacht. I don’t typically read French books in translation, as it seems kind of pointless—if I’m not reading a novel in its original form anyway, I might as well read it in a language in which I’ve written multiple books, instead of one in which I still struggle to order things effectively in restaurants. But you take what you can get. It’s interesting to compare this book to John Hersey’s The Wall, especially since I started and finished Hersey’s book during the period in which I read Hilsenrath’s (French books take me forever). Both stories are about Jews living in ghettos in Eastern Europe under Nazi occupation: The Wall takes place in Warsaw, Nuit in a city in Romania. Both describe the harrowing circumstances in great detail. The chief difference is in their tone. While The Wall doesn’t shy away from the horror of the Warsaw ghetto, its nevertheless retains a level of hope cut with realism. Life is hard, and people do turn on each other, but their remains a certain camaraderie, and even heroism. But that’s too simplistic a take. 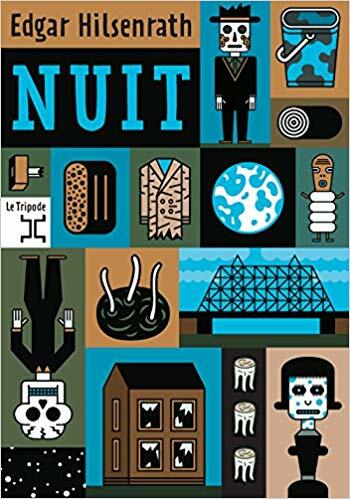 There is heroism of a sort in Nuit, and as shabby as it may seem, it’s nonetheless remarkable given the circumstances in which the characters find themselves. This heroism emerges in simple moments of humanity. Every choice a character makes in which self-interest is not the pervading driver is in itself heroic, because the substance of their lives has worn so thin that the slightest yielding could cause them to rip in two. To offer shelter to two orphans may seem like basic human decency; asking them to pay for the privilege in cigarettes sounds downright mercenary. But for Ranek, who does just that, taking them on costs him dearly in the goodwill of his neighbors, and such a currency is the only in which he remains even remotely solvent. When you look at it that way, trading a roof for a few cigarettes seems generous. I can’t comment much on Hilsenrath’s prose, since I observed it through the double filter of translation and a foreign language, but on a purely practical level it appeared ornate enough to push my facility with French to the limit. I’m picking up Camus next, and just thinking of his prose in comparison feels like a relief. As for his story and characters, there is a richness here, one leavened with a bitter sort of humor without being cheapened by it. A powerful book. *On essaie de rester humain… et après? Qu’est-ce qu’on y gagné?